Not bad when you consider that this is max at what my monitor can do. ATi really shows how then win price/performance. Huh? 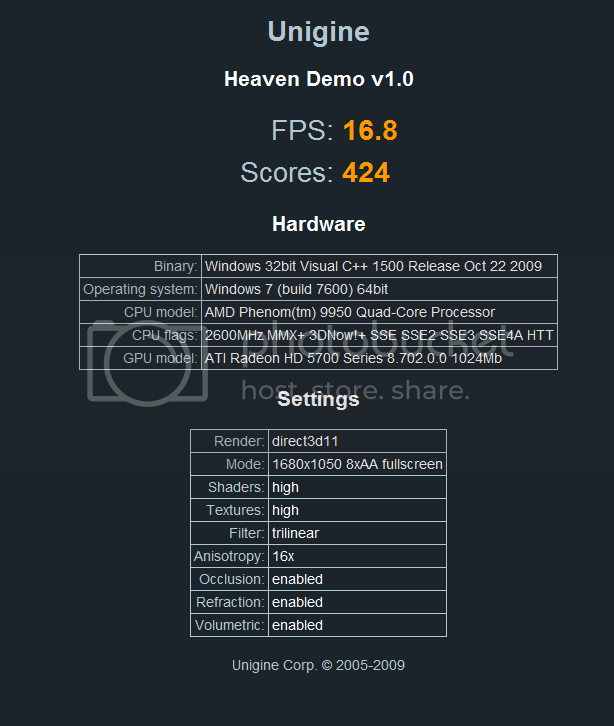 Obviously they're way better in a DX11 benchmark, NVIDIA doesn't even have consumer-level DX11 cards out yet. I meant that if I ran it in DX10. Obviously nVidia can't win any awards (except maybe procrastination) when it comes to DX11. It uses the 2nd GPU on games and vantage,never looked on Heaven tbh. Yeah, I got the Voltage set to 1.3 on water. Any voltage below that and it would artifact and recover. I could go higher but I don't want to pump alot of voltage to the card. Temps are 31 idle and 46 load.